May 13, 2012 Happy Mother’s Day! Lilacs make a pleasant addition to a memorial garden. With Mother’s Day this weekend and Father’s Day coming up in June, many people whose loved ones have passed away wonder what they can do to celebrate their lives in a special way. Algiere’s Landscaping has the solution. Why not give us a call and allow us to help you design and plant a memorial garden? The beauty of a memorial garden is that it can be designed to bloom around you loved one’s special day each year. There are no set rules, you can include plants and other effects that remind you of your parent, spouse, or child. You could for example include flowers that were their favorite color, use stones or shells or other items that remind you of a special trip. 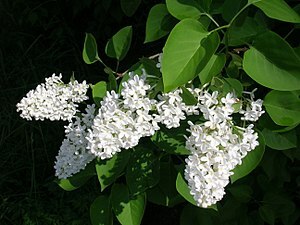 Did your mother use a certain perfume, did the linens in your house growing up smell of lilac or lavender? Include a lilac bush or a plot of lavender. Was your father’s spaghetti sauce the talk of the neighborhood? Why not include some tomato plants, using old sauce pots as planters? The possibilities are as endless as your imagination and memories. Ben can help you make your ideas a reality, by using his expertise to arrange plants and elements such as a bench or fountain while keeping proportions and seasons in mind. That way, you’ll have a memorial that will last year after year with proper maintenance. This entry was posted in Uncategorized and tagged Father's Day, gardening, gardens, landscaping, memorials, Mother's Day, nature, planting, plants, sauce pots, spaghetti sauce, talk of the neighborhood, tomato plants on May 13, 2012 by mspetersonexplains.